Thank you again for SewCaGal for sponsoring the Free Motion Quilting Challenge 2012. 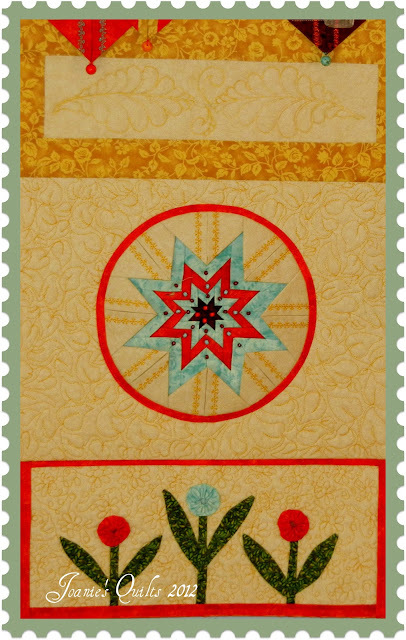 Clicking on the Free Motion Quilting Challenge icon below will direct you to SewCaGal's blog featuring March's Free Motion Quilting tutorial with instructor, Ann Fahl, a talented free motion quilter. She has been doing FMQ for over 30 years which qualifies her to be called an expert. Wouldn't you say! I love Ann's motif Loop and Twist. I added a daisy like flower to Loop and Twist to give the design some whimsy to go along with the YoYo flowers. Each month's challenge block will be added to previous FMQ Challenge 2012 blocks making a wall hanging. The wall hanging will be a display of free motion quilting, applique and other techniques used by quilters. While free motion quilting I kept thinking that the loops and twist were like bees flying to and fro buzzing around the daisies. Bzzz Bzzz Bzzz. I was feeling a little Bzzz myself while free motion quilting. Why? Because I had eaten a couple of easy, fast and no bake Energy Bars. Throw all the ingredients in a mixing bowl, taste test, stir a bit more, taste test again, chill for about 30 minutes. Roll into balls. They will store for about 1 week in an airtight container for up to 1 week - that is if they last that long. Enjoy! Don't forget to visit SewCaGal's blog. You will love Ann Fahl's free motion quilting tips, stuff and see the covers of her published books. Just click on the icon below. Happy quilting and happy Friday to you! Great wall hanging. Your stitching looks good. Aren't you loving the challenge and seeing improvement. I needed the nudge to get out of my rut. My gosh your quilting is lovely. Glad to see you are having fun with the challenge. 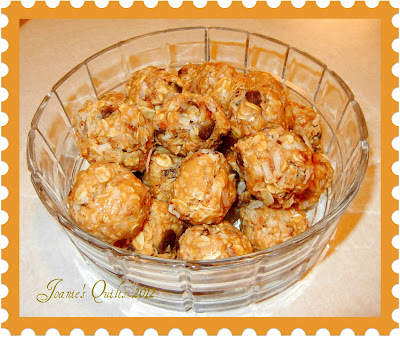 Those energy balls look so yummy. I think the first thing I need to try is the cookies. I should be doing the quilting. Beautiful job, Joanie! The anonymous is Nonie. I just don't have time to register. Beautiful wall hanging and it looks like you are really enjoying the FMQing QAL! Yummy looking energy balls!